I want to leave my business, but know I can’t afford to! You want to leave your business. You might be a little tired; you might be a little bored. You have this nagging feeling that as much as you would like to do so, you know that you just can’t afford to move on. Someone might have asked you when you were going to retire. You might even have said in five years. The unfortunate thing is, you could find that in two years retirement still is five years away. There are things you can do to make sure this doesn't become a permanent situation. 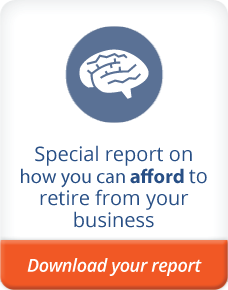 Your business isn’t going to get you to retirement all by itself. You’ve believed that if you just do a few different things it will. For the past several years you’ve thought that getting out of your business is only a few years away. As the years have gone by, you keep pushing out the date. The problem is the date never seems to get any closer. You can create more cash flow every year that you then save. You can find a way to make your business worth more to a buyer. You can diversify your investments. You can realize that you’ll need at least two more funding sources besides your business to retire. You don’t need to diversify for safety; you need to diversify to leave. If you don’t diversify your investments you’re not going to be able to retire. You need to put lots of money into your 401(k) plan. You’re going to need to have other investments that are outside your business. The sad fact is, your business is never going to provide you the same amount of cash flow after you leave than while you own the business. You need to learn the difference between cash flow and cash created by investments. The difference is huge! The right question isn’t asking how much can I sell my business for? A better question is how do I need to organize my finances so I can leave my business and not have to work for someone else? The answer to the second question is very different from the first. 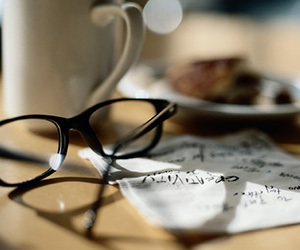 Here are some special reports that might help you know what you need to leave your business. 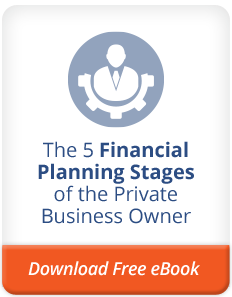 Start with the Four Boxes of Financial Idependence. It’ll give you an easy way to figure out what you need when it’s time to transition out of your business. The Patrick Group, Inc. (DBA Stage 2 Planning Partners) is a registered investment adviser located in South Burlington, Vermont. The Patrick Group, Inc. may only transact business in those states in which it is registered, or qualifies for an exemption or exclusion from registration requirements. The Patrick Group, Inc.’s web site is limited to the dissemination of general information pertaining to its advisory services, together with access to additional investment-related information, publications, and links. Accordingly, the publication of The Patrick Group Inc.’s web site on the Internet should not be construed by any consumer and/or prospective client as The Patrick Group, Inc.’s solicitation to effect, or attempt to effect transactions in securities, or the rendering of personalized investment advice for compensation, over the Internet. Any subsequent, direct communication by The Patrick Group, Inc. with a prospective client shall be conducted by a representative that is either registered or qualifies for an exemption or exclusion from registration in the state where the prospective client resides. For information pertaining to the registration status of The Patrick Group, Inc., please contact the state securities regulators for those states in which The Patrick Group, Inc. maintains a registration filing. A copy of The Patrick Group, Inc.’s current written disclosure statement discussing The Patrick Group, Inc.’s business operations, services, and fees is available at the SEC’s investment adviser public information website – www.adviserinfo.sec.gov or from The Patrick Group, Inc. upon written request. The Patrick Group, Inc. does not make any representations or warranties as to the accuracy, timeliness, suitability, completeness, or relevance of any information prepared by any unaffiliated third party, whether linked to The Patrick Group Inc.’s web site or incorporated herein, and takes no responsibility therefor. All such information is provided solely for convenience purposes only and all users thereof should be guided accordingly. : The Patrick Group (DBA Sage 2 Planning Parnters) is a registered investment adviser. Information presented is for educational purposes only and does not intend to make an offer or solicitation for the sale or purchase of any specific securities, investments, or investment strategies. Investments involve risk and, unless otherwise stated, are not guaranteed. Be sure to first consult with a qualified financial adviser and/or tax professional before implementing any strategy discussed herein. Past performance is not indicative of future performance. ©2019 Stage 2 Planning. All Rights Reserved.